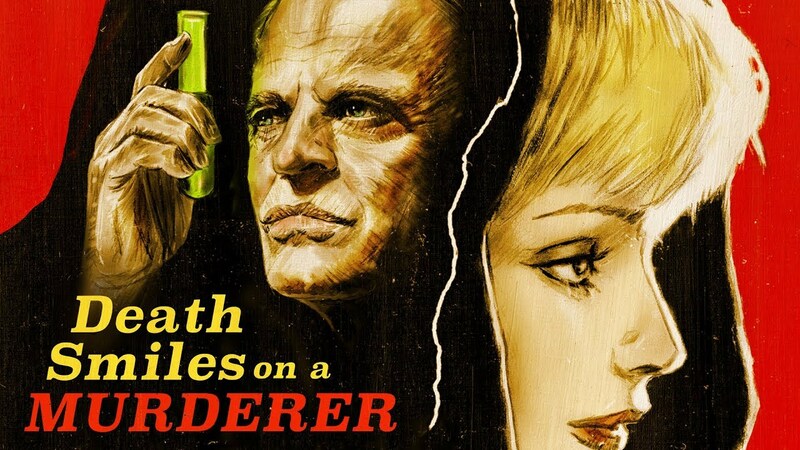 Adam has no idea what’s really happening in the Klaus Kinski starring Death Smiles on a Murder, but he isn’t sure the filmmakers understood either. Which makes it on par with most Kinski vehicles. The film is being released on Blu-Ray by Arrow Video. One thing is for sure, there was never a piece of insane material that Klaus Kinski did not love (for the right price). Directed by Joe D’Amato, Death Smiles on a Murderer is a semi-lucid waking dream/nightmare of a psycho-sexual horror film. The story makes as much sense as a book whose pages have been rearranged in no particular order. As much as one can glean from the film it concerns a murderous hunchback Franz (Luciano Rossi) and his sister Greta (Ewa Aulin). Franz has been in an incestuous relationship with his Greta who has fallen in love with a Doctor. That doctor accidentally kills her during childbirth. Franz enraged kills Doctor/Lover and manages to bring Greta back from the dead. She is no living but rather a byproduct of Franz using an Ancient Mayan ritual. After being zombified, Greta by way of a horrific accident escapes Franz and intricates herself into the lives of a couple. Eva (Angela Bo) and Walter von Ravensbrück (Sergio Doria) though helpful find themselves at the mercy of not only Greta but her Brother and a slew of Macabre happenings. Director D’Amato and his co-screenwriters Romano Scandariato, and Claudio Bernabei really have no handle on how to tell a coherent story. Much of the film is spent towards the building up to its sexual and horror set pieces. Because of that effort, characters and plot suffer to an almost debilitating effect. The plot is an afterthought in their hands. Though the visuals and set pieces are sumptuous and bizarrely beautiful. Without a plot or a basic functioning story that most Giallos have, there is nothing to hold onto between those excellent set pieces. The movie feels like its grasping at being a horror twinged Visconti film but falls short of that lofty goal. There is much to appreciate in the film. It begs to be repeated that the set pieces are nothing short of brilliant. There are intricacies and details to them that can be appreciated even if everything else falls flat. Even those and the presence of Kinski playing a perverted doctor (what else does one expect from him) cannot help this from only being an interesting failure. Which is made all the more frustrating that the sum totals do not equal its very interesting parts. Whatever my feelings on the film itself, the transfer is flawless. This Brand new 2K restoration from the original camera negative is nothing short of beautiful. Arrow Video continues the tradition of giving us the best visual version of Italian genre films. A sampling of prior versions and what is available online is almost night and day differences. The commentary by Critic Tim Lucas is a great listen. Lucas brings his typical fun conversational insight to the film and D’Amato as a director. D’Amto Smiles on Death is a 16-minute interview featuring the chain-smoking director discussing the film’s creation, production, and ultimate cult status. All About Ewa is a new 60-minute interview with Star Ewa Aulin as she discusses her career in detail and her work on this film. This is possibly the best feature on the set as Aulin deep dives into her career with an honesty and wit that few actors ever bring to these features. This is by far the best feature on the disc and worth the price alone! Smiling on Taboo is a 20-minute visual essay by new video essay by critic Kat Ellinger. It’s a nice addition and definitely gives context to the film and D’Amato’s career as a whole. Death Smiles on a Murderer though a fascinating combination of turn of the century pageantry, psycho-sexual dynamics, and horror are just that… fascinating. As a film’s lack the narrative cohesion to lift it up beyond a standard 70’s Giallo. Arrow has packed this with a great transfer and thoughtful special features. For any fan of this film, this is a definite recommend.